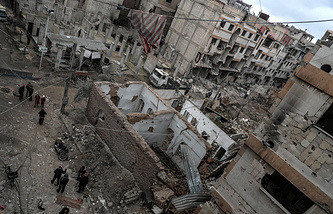 DAMASCUS, February 28. /TASS/. The second humanitarian pause has been disrupted, like the first one, by terrorists’ mortar shelling, Maj Gen Vladimir Zolotukhin, a spokesman for the Russian center for reconciliation of opposing sides in Syria, told reporters on Wednesday. 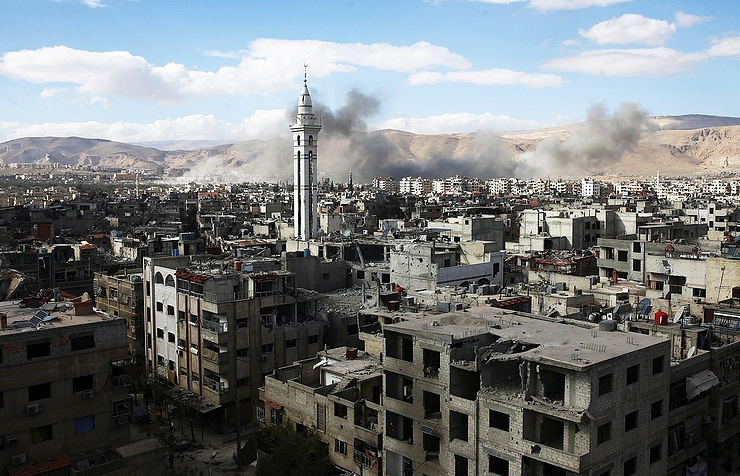 "Upon the completion of the second humanitarian pause, none of the civilians has been able to evacuate from Eastern Ghouta due to mortar shelling by militants," Zolotukhin said. Ambulances and buses for civilians remain on stand-by in the humanitarian corridor in Al-Wafideen, according to the general. Earlier, Zolotukhin said that more than 300 civilians had gathered near the evacuation route in the morning to flee Eastern Ghouta. 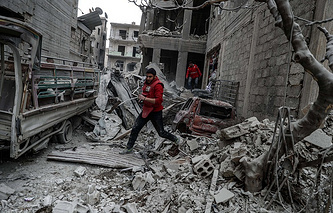 The UN Security Council last Saturday voted for a resolution demanding all parties to the conflict in Syria should terminate hostilities at least for 30 days for providing relief aid to the population. All fifteen members of the UN Security Council, including Russia, supported the resolution. The truce will not apply to military operations against the group Islamic State (outlawed in Russia) and other terrorist organizations. Russian Defense Minister Sergey Shoigu on Monday said that on instructions from Russian President Vladimir Putin daily humanitarian pauses were introduced in Eastern Ghouta (a suburb of Damascus) from 09:00 to 14:00 local time starting from February 27. In the village of Al-Wafideen the Syrian authorities and Russia’s center for the reconciliation of conflicting parties have created conditions for the accommodation of civilians who may decide to use the sole humanitarian corridor connecting Damascus and Eastern Ghouta. Nevertheless, the evacuation efforts were derailed on Tuesday, due to mortar bombardments by insurgents. Maj Gen Vladimir Zolotukhin, a representative of the Russian center for reconciliation of opposing sides in Syria, said that every half an hour the militants were pounding the evacuation route for civilians from Eastern Ghouta. As a result, the evacuation was disrupted and none was able to leave the area. Moreover, the armed groups continued attacking the positons of Syrian government forces near the villages of Hazram and Nashabiya during the humanitarian pause and after 13.00 local time launched an offensive in other directions.